Sometimes a Tree’s problems are so advanced that it can’t be preserved! 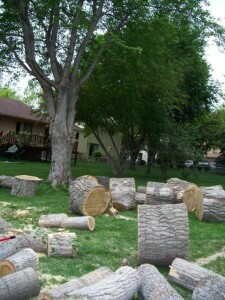 In the event that a Tree is to be removed whether it be dead, hazardous, or in a bad location we use the proper equipment and techniques required to do the job. 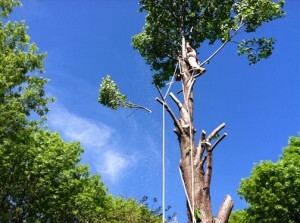 The often dangerous and technical work of taking down Trees requires experience to eliminate safety and liability concerns. Some Trees may be in a location where it is not practical to bring in large equipment and will need to be climbed with traditional ropes, belts and other rigging techniques. Some Trees may be considered too hazardous to climb and require larger equipment such as Cranes, Bucket Trucks or a Specialized Lift that can access smaller areas. Please understand our commitment to the safety of all our team members, our good reputation, your satisfaction and leaving your property in the best possible condition upon completion of the process may require some additional up front cost that will be worth it in the end. Please continue to choose us so we can continue to serve you in the manner you have come to expect.